Gran Turismo 5: One of 2010's Top RPGs? Is the most prominent driving sim of 2010 also one of the year's biggest RPGs? Lately, I've been playing a game where I earn experience points and level up by completing quests. I collect equipment and upgrade my character by defeating an array of AI-controlled NPCs in combat. The story of the game's world goes back decades. No, it's not World of Warcraft or Fallout: New Vegas. I'm talking about Gran Turismo 5. Working my way through the mass of content Polyphony Digital shoved onto Gran Turismo 5's Blu-ray disc over 5-6 years of development, I really started to feel like I was really playing an RPG instead of a driving simulator (and not because of its B-Spec mode). I'm a little confused by it too, but let me explain. The quests I speak of are Gran Turismo 5's racing events, which are filled with exciting combat that takes place at 150+ MPH. Players are given tasks to collect specific cars to race in unique events, such as one that only allows sport trucks like the Dodge Ram, or another that only allows cars from 1969 or earlier (shout out to my '62 Buick Special). You might not be slashing goblins or disarming traps, but Gran Turismo 5 does pit you against challenging opponents in very specific ways, and requires you to come out on top with pure skill, or just powerful equipment. Sound familiar? If "combat" requires actual blood to be spilled, just exchange blood for paint, which is traded aplenty in Gran Turismo 5, and the game resembles Final Fantasy more by the minute. For a game to truly become an RPG, it also has to have a form of character progression and a story. Where are these aspects in Gran Turismo 5? Easy. In Gran Turismo 5, your character is a silent driver that inhabits the game's cars. In a way, the player is the car. These cars can be tuned with new parts, just like a Dragon Age character can put on a new helmet. 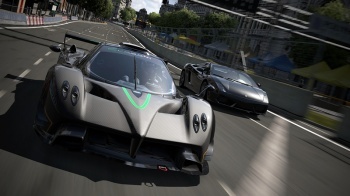 The driver experiences just as many life changes as characters from an RPG, going from Mini to Civic to rally car in different regions of the world within the span of an hour, and finishing multiple "quests" in a different way with each change of vessel, leading to the accumulation of more power for future endeavors. The story is also right there by your side the whole time. Polyphony has included a detailed history for every car, and since the player basically is the car, that's your history. On the other hand, the game's current-day narrative is written through the player's racing habits. For example, my story has taken me into a hectic battle on the streets of London, seen me triumphantly destroy my foes in evenly-matched Volkswagen Bus combat, and I've even survived a few deadly mid-air flips on occasion (shout out to that '62 Buick again). The story is what you make it, thanks to the freedom Gran Turismo 5 gives the player and some random factors thrown in. It's not Lord of the Rings, but it is a form of story nonetheless. Do these factors add up to make an RPG? Take Gran Turismo 5's racing and exchange it for battles against varying types of ogres and wombats in a game where you play as a soul that inhabits the bodies of different monster slayers as they destroy evils across the world, and you've got yourself a great RPG right there. The way that Gran Turismo 5's pixels are assembled shouldn't necessarily exclude it from being an RPG. In the case of certain games, genres are simply becoming blurry. At the end of the day, it doesn't matter what umbrella Gran Turismo 5 is put under, but it's interesting to see the similarities between the game and other titles often viewed as being on the completely opposite side of the spectrum.